This is basically a double review, of a game and it's expansion pack. As such, it is rather long. If you just want to read the review for Extend, just skip down to it's box art for the review on that. Just a small foreword of sorts. 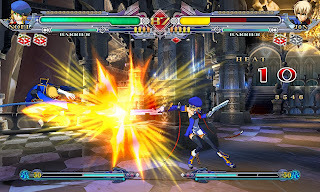 Blazblue: Continuum Shift is a 2D fighting game, sequel to Blazblue: Calamity Trigger and is developed by Arc System Works (famous for the Guilty Gear series). Even though it's a fighting game, it's main attraction is arguably the in-depth story and complex characters, though the fighting aspect is still well done. With it being a sequel to a game with a complex story, the story can start off a bit confusing. Though playing through the story mode will help newcomers understand what's going on, it can start off with you being totally lost about what's going on. Fans of the previous game however will have no problem figuring out the current events that are happening. As for the story itself, it's very deep and the immersion it provides is incredible. Many fighting games provide only a small amount of story to follow, but Continuum Shift's story mode is possibly the best thing about it. The story can pull off a few shocking swerves, and it further develops many of the characters, while leaving players wondering what will happen next. The complex nature is only furthered by the gray morality that most of the characters have, with having a set good or bad goal and doing whatever it takes to reach that goal. There's also multiple choices to be made in each individual characters story mode, with two to three endings being obtainable for every last one of them. It's complicated to explain, but anyone who is a fan of story heavy games and being able to make multiple choices that branch off to different paths will greatly enjoy this games story mode. As for the fighting game players who simply wish to knock out anyone they come across in the game, the arcade mode will provide just enough story so you're not lost without stalling for so long that your adrenaline is gone before the battle begins. As a side note, the story is essentially an anime that you fight through, but it's a well done story so that shouldn't be a problem to those who aren't fans of the genre. As previously stated, the game's most notable aspect is the story mode, but that doesn't mean the gameplay is lack-luster. It's a very fun game with a variety of modes for players, and has plenty to do, so the game isn't done when you beat it once with everyone. In addition to the standard Arcade and Story Modes, there's Legion Mode, which is basically just "conquer a few maps through battling with your team of choice" and Score Attack, which is only for the most advanced players who can handle the hardest the game can throw at them. The modes aren't exactly innovative, but they're all done quite nicely and are very enjoyable to play through. Though there are two notable issues. The first one is the boss fight at the end of Arcade. With Score Attack, you know it's supposed to be absurdly difficult, so nothing wrong with it fulfilling that purpose. However, the final boss of Arcade Mode is incredibly difficult, regardless of skill, and though he can become a bit predictable if you've fought him enough times, he'll still cause a serious challenge. While I wouldn't say tone it down, they do use cheap tactic or two that greatly adds to the challenge that he provides that can and will bring great deal of frustration to the player. The other issue is that the ending isn't heavily changed between characters, so you don't get the feeling that there's any real point to beating it with everyone if you're just gonna get the same exact ending. It's the only time any story related content is lackluster, but it still leaves the player slightly disappointed and wanting more. However the core gameplay is extremely addictive and a great deal of fun, and it goes above and beyond the standard fighting game experience. The control of the game is extremely accurate and responsive, and easy to learn as well. The fighting style is similar to Street Fighter, with quarter-circle this and that to do special moves and whatnot, so it's pretty easy to adapt to this control scheme, as many fighting game players have played Street Fighter. It's simple to learn and difficult to master, which is a very fine line, and it gives newcomers the ability to jump right in and know what to do. The special moves are easy to perform, but not so easy that you can do one move over and over, the special match ending moves, called Astral Heat, is incredible to see if you manage to pull them off (don't worry, it's under strict restrictions and only for the match ending round, so you won't just randomly lose at the beginning of the fight), and the layout works well for both PS3 and Xbox 360 players. To put it simply, the controls are as responsive as possible, and they probably couldn't be improved on. The game is in anime-style graphics, so they can get very detailed and interesting. The character designs are pretty unique and easy on the eyes, and the variety in how the stages look make sure that there's not an immediate sense of repetition. The Astral Heats, those aforementioned match ending moves, are absolutely phenomenal to watch whenever they're performed and never get tiresome to see. 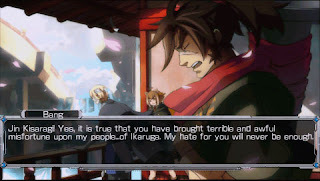 However, the game does run into an issue that many anime-style games have, where character models seem limited in how many different emotions will be shown during the dialogue. There's enough variety so it doesn't look lazily done, but it seems that each character has around six to eight expressions. The other issue is that the actual cutscenes look terrible. The characters are off-model, they look pretty unusual, and there are only a few legitimate cutscenes, so it feels disappointing that most of them aren't too spectacular. However, that's the fault of the animation studio, Gonzo, rather than the actual development team so I won't hold it against Arcs System Works for something beyond their control. For the most part, the graphics are visually appealing and serve to better the overall experience that Blazblue: Continuum Shift provides. To summarize, both the voice acting and the soundtrack is as perfect as they can be, with the closest thing to a flaw being that you can't listen to the full songs in the game. The voice acting is done by very gifted professionals, a who's-who of voice actors, and they really help make the characters all the more likable. Their acting is superb, and they each make their character's traits either more enjoyable or more haunting. As for the soundtrack, the songs are a lot of fun to listen to, and they each sound unique and wonderful at expressing each character or situation. They really can't be improved upon, and that's a not a feat commonly accomplished for the sound aspects of a game. There is plenty to do in this game, and a number of things to unlock. It isn't something you can just blaze through and be done with in a single weekend, especially if you want to get good at the game. The story mode alone can take a few days to get through with everyone if you don't skip through the between-fight cutscenes. With every fighting game, the length varies with how skilled you are, but there's definitely a huge amount to do. It's also a game you'll pop into your system multiple times, and you won't just play it once. If you're a fan of fighting games in general, this one's a must. 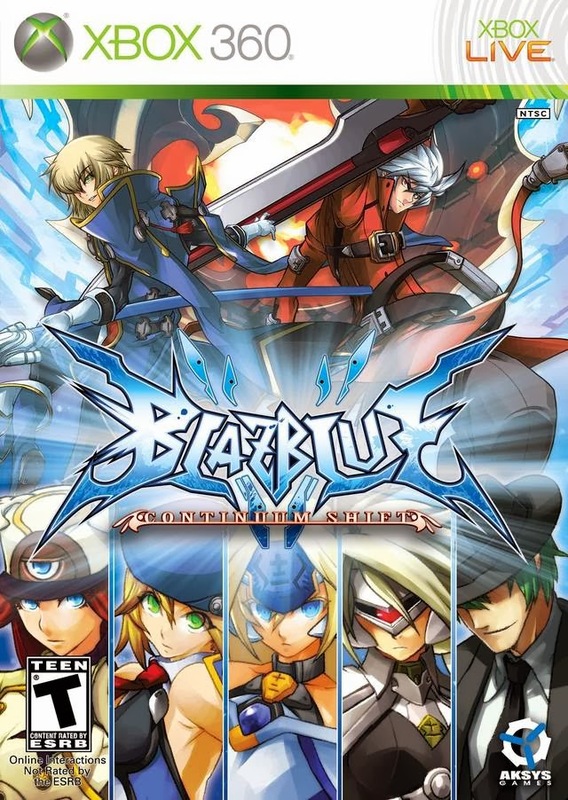 It's a very well done and underrated game that should be played by a much higher amount of fighting games fans. If you're not a fighting game fan but you're intrigued by the story, you may want to borrow it to see if you will enjoy the fighting aspect for this game, but I'd still recommend buying it if you think you'll have no problem enjoying all that this game has to offer. 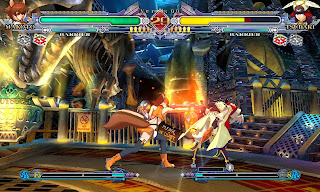 Overall, Blazblue: Continuum Shift is an impressive title that improves from the last game while adding enough for newcomers to enjoy. It's definitely a fun game to play, and it's an experience that won't instantly be forgotten. Any fighting game fan should try it out, and fans of immersive stories and multiple endings based on your decisions should check it out as well. It's an amazing game and you won't be disappointed. But there is an expansion, an "Ultimate Edition" so to speak. Blazblue: Continuum Shift Extend is the updated version of Blazblue: Continuum Shift, with all DLC added and extra chapters in the story for the new characters. It features new cutscenes and tries to balance out the gameplay, and is much better for newcomers to start at. As it's essentially an expansion pack, the things that will be covered are simply what's added. The story is improved upon, with the new characters getting relatively in-depth development, as well as being seamlessly added into the plot. The new characters were NPCs from the previous games, so it's only natural that they fit in so well, but it's still nice that their stories aren't confusing and generally don't feel tacked on. Besides that, the best part is what they call the "Calamity Trigger Reconstruction", which is a playable summary of the previous game. It really helps newcomers understand the plot of Continuum Shift, and returning players shouldn't have a problem going through it as it isn't tedious or annoying. They also expand on the characters and factions, and really make the story more enjoyable. Overall they took arguably the best aspect of the game and improved it greatly, and the work the development team put into it really shows. First off, the new characters are once again seamlessly added into the gameplay, and their fighting styles fit perfectly into the overall play style of Blazblue. They're welcomed additions, and really do fit right in. The game modes are also improved upon, with a more interesting mode, Abyss Mode, replacing Legion Mode. Where Legion Mode was a somewhat tedious conquer by force type of mode, Abyss mode is essentially a survival mode. You can improve your stats to make your character a better fighter, as well as purchase certain boosters to help keep you alive and fighting. It's a much more enjoyable mode than Legion, and I find myself challenging it's multiple difficulty levels over and over again. The other new addition is called Unlimited Mars Mode. While Score Attack is still in this game, it's been toned down to be a bit more easy to beat. Unlimited Mars Mode however will only be beaten by the more elite players, and is certainly not something you can just jump in and hope for the best. It's a nice addition, and I like that it allows Score Attack to be more accessible to all players, while Unlimited Mars is almost like a hard mode for Score Attack. The final change is pretty noticeable to completionists, the gallery. One thing Extend changes is that you can now level up and unlocked more content to purchase, which is always fun, but it's done in a way where it's most beneficial for those who bought Extend before playing the regular version. You level up by simply beating all the different characters Story Modes, as well as their Arcade Modes, so it's pretty easy to understand, but it only affects the gallery. Now you can unlock new costumes, powered up versions of the fighters, called Unlimited (character name), which makes unlocking everything much easier. My main gripe with it though is that the game does not automatically level you up based on what you did in the standard version of Continuum Shift, so all the points you would have gotten from playing through Story and Arcade Mode is gone and have to be re-acquired. You also need to beat Arcade Mode with each character again to re-unlock their ending, which is rather frustrating if you made a decent amount of progress. You also, strangely enough, have to re-unlock the videos from Story Mode, but not the images. It may sound like a nitpick, but it does get annoying doing the same thing twice just to unlock the new content, as opposed to having it available from the start. As a side note, the controls are unaltered and remain very nicely done and accurate, and the new characters don't have any nuisances that are common in added on content. The graphics are improved upon from the previous game, if by a subtle amount. Any new cutscene is now much better looking, there's a greater variety of character models and costume colors, and the graphics are just overall improved on. The added on characters are also nicely done, and had no trouble going from NPCs in the previous games to playable characters. Here's where the game really scales back. With this being an updated re-release, new dialogue had to be recorded and not all of the characters original voice actors reprising their roles. The most notable change is the main villains voice being very noticeably changed. Where the original voice actor made the character sound suave and malevolent, sadistic and oh so charismatic, the added on cutscenes with the new voice actor just make him sound like a whiny brat. It's a stark contrast and considering he's heavily featured, it gets annoying pretty fast. The other change was the title theme. I thought the original one was well done and really cool, while the new one isn't bad per se, it feels like an unnecessary step down from the original. These may sound like nitpicks, but it really is a noticeable change that can come as a disappointment to fans. They may not be able to control if the voice actor returns, but they can find someone who doesn't sound like a completely different person. With the new amount of unlockable content as well as the new modes to enjoy, Extend has a higher replay value than it's predecessor, which had a huge number of things to do. If you're starting the series with this game, you'll have a huge amount to do and experience, and a wide variety of things to accomplish. If you played through the previous Continuum Shift game, you'll still have some things to do as a number of things are updated and there's plenty to unlock that wasn't previously there. It all depends on how much you played the original version of Continuum Shift, but there is plenty of things to do in this game. If you never played a Blazblue game before, then this is an amazing start. If you never owned Continuum Shift, then I'd recommend skipping over it in favor of Extend, as the additional content is a lot of fun, and they don't take away anything that will be really missed, that they can control at least. 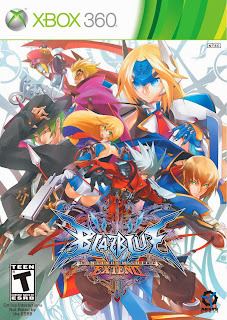 Blazblue: Continuum Shift Extend is a great expansion pack, and works just even better as a standalone title. If you're a fighting game fan then it's a must own. If you've played the previous Continuum Shift then you should still check this game out, as the added on content is a great addition to the series. It really shows the positives and mostly takes out the negatives, with any poor change being made due to reasons beyond their control. It's a great fighting game that takes the best of the series and makes it even better, and provides an even more addictive experience that can't be completed in a small amount of time. It's a great game and one any fighting game fan should check out.